"...a diverse group of planetizens trying to learn from each other and expand the collective human intelligence through SketchUpping." Beautifully put. The first day will include basic training for beginners, learning sessions for everyone, and a huge party with food and a live band -- right smack dab in the middle of the Google quad. Day Two will feature even more sessions, and Day Three is dedicated to a hands-on design project where everyone can apply what they've learned. Take a look at the preliminary program for more details. 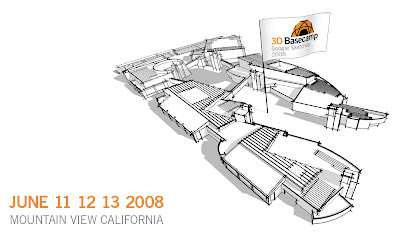 About forty of us members of the SketchUp team will be making the trek to Mountain View for the event, and we'd love to see you there. There's no charge to attend, but space is very limited; check out the 3D Basecamp website before April 22nd to find out how you can join us. See you in California! I received an email about this event in my Gmail and signed up within 4 minutes! Having used Google Sketchup to sketch some of my "dream houses", I was extremely fascinated by the software and hope to be able to learn as many techniques as possible - and found this Basecamp Godsend. Hope I get selected to attend. In some way I dont think the random way are fair to us long away, wait for the end May will cost some extra 1000 dollars for flight tickets. I need a ride from SF to basecamp, anybody driving?